Give Gary Oldman every award on the planet for Darkest Hour. His turn as late British Prime Minister Winston Churchill is a titanic performance. This latest film from director Joe Wright (Anna Karenina) offers a fine companion piece to Christopher Nolan’s Dunkirk with its deftly plotted and time sensitive dramatization of Britain’s war efforts, specifically with the evacuation of Dunkirk, and a rousing parable of great leadership. But where Dunkirk excels as a true ensemble piece, Darkest Hour succeeds as a star vehicle. It’s Oldman’s finest hour. The film zeroes in on the first two weeks of Churchill’s term as Prime Minister, which also coincides with the evacuation of Dunkirk and the escalation of Britain’s war effort. There’s trouble in Parliament when the film begins and the parties don’t have confidence in sitting PM Neville Chamberlain (Ronald Pickup) and the turkeys in the Conservative party need a fall guy who can hold the fort and absorb all the unfavourable sentiment headed their way. Lord Halifax (Stephen Dillane) declines the offer—he wants the job, but he doesn’t want it now—and Churchill becomes the best worst option for the party. Churchill is not an especially savoury character when Darkest Hour introduces him nearly ten minutes into the picture. His new secretary, Elizabeth (Cinderella’s Lily James), is clearly one of many girls cycled through the politician’s employment. Following a briefing on the job that could easily be a pep talk before going to work for Miranda Priestly, Elizabeth scurries into the room and Churchill greets her with the surliest hello imaginable. He’s still in bed and barking orders from behind a cigar whilst enjoying a whisky for breakfast. Things improve after a shaky go of it, since Churchill has wanted this promotion all his life. His meetings with King George VI (Ben Mendelsohn, Mississippi Grind) let us watch a political animal at work as Churchill skillfully finds common ground with a King who didn’t think he was the man for the job. Oldman’s scenes with Mendelsohn are especially strong, even if Mendelsohn has the unenviable misfortune of giving his nuanced turn of George when Colin Firth’s Oscar-winning performance is still a recent memory. However, the comparison helps one see that Oldman’s Churchill will undoubtedly be the one to define the character in film just as Firth’s does for the king. 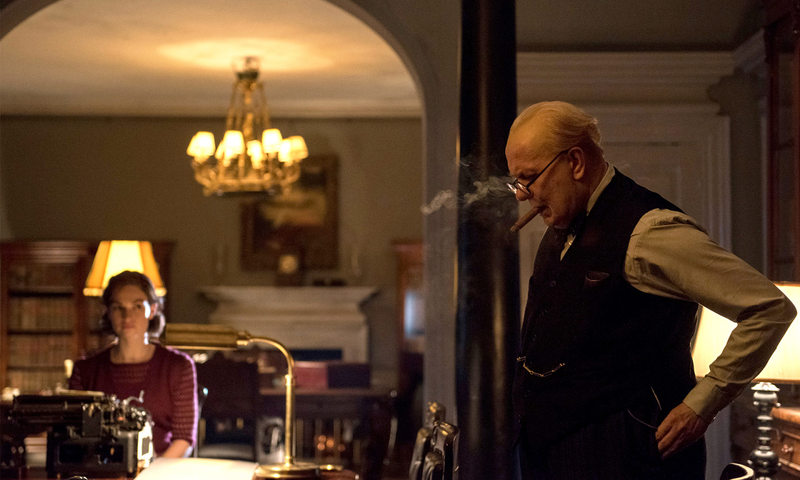 Oldman relishes the faulty and theatrical elements of Churchill’s persona. His performance, Wright’s direction, and the script by Anthony McCarten (The Theory of Everything) humanize this hero from the outset. Here’s a man who yells, smokes, drinks, mumbles, and dictates his thoughts while in the bath or on the loo. He is, in a sense, an everyman despite coming from the upper crust of British society that lets a man run the country without ever having ridden the tube. (A fact he admits after receiving notice that he’s to become the next Prime Minister.) Oldman, underneath pounds of make-up, gives us a blustery and passionate blow-hard of man. He’s a bulldog with trembling jowls and a gravelly bark. And he demands respect as Oldman commands the screen. Wright has a great flair for melodrama and he rebounds after the misfire of Pan with this stately showpiece that draws upon the great overtures of his direction. Each scene of Darkest Hour is bathed in a grand theatricality—not the literal theatricality of Anna Karenina, mind you, but rather elegant theatrical flourishes that spare no expense in the aesthetics. The cinematography by Bruno Delbonnel steeps the corridors of Parliament and Buckingham Palace in regal swathes of natural light, elevating Churchill, but also humbling him as a man more comfortable in smoky rooms and shadows. Delbonnel’s fluid camerawork glides throughout the interiors and underground war rooms, giving us an all-seeing eye to history in the making while Dario Marianelli’s score intricately accentuates the tense passage of time and the urgency of the matter at hand. The film takes some great dramatic liberties including a fictional scene in which Churchill takes a ride in the tube and gets to know his fellow citizens. He faces the awful choice of negotiating a peace deal with Germany to avoid putting the nation in jeopardy, but surrendering to the Nazis doesn’t sit right with his conscience or his sense of the British character. As Churchill rides the tube and gains the notice of his fellow passengers, he seeks their advice on whether they’d prefer to wave the white flag or the Union Jack. The sequence is the kind of liberty that might make or break Darkest Hour for some audiences, but Wright lands just the right tone for the exchange and Oldman relishes the material as this cozy, easy-going Churchill proves himself a man of the people. Darkest Hour smartly juggles Churchill’s professional struggles with his personal ones. Scenes at home show a family’s sacrifice for one man’s dreams and power. Kristin Scott Thomas gives an excellent supporting turn as Clementine Churchill, a coldly supportive woman who can’t mask what she’s given up in her husband’s road to office. Whether delivering a double-edged toast to her husband’s new title or sitting alone, posing for photographers while Churchill addresses the nation, Scott Thomas’s chilly, dignified performance is one of subtle self-sacrifice. The story of Churchill’s effort in aligning Britain’s rickety boat and a turbulent Parliament is very effective in McCarten’s effectively tightened, focused, and streamlined script that rarely leaves the corridors of power. The concentration of Darkest Hour as the man with the unenviable weight of a nation on his shoulders elevates the film above the level of a standard biopic by giving a fine and thoughtful portrait of Churchill’s leadership during one pivotal moment in his career. There are resonant lessons from which the leaders of today could learn, too, as Churchill surrounds himself with allies and enemies to make for thoughtful debates that tackle Britain’s war strategy from all angles before making the difficult calls. With Oldman at the helm, Darkest Hour makes for riveting drama with its clipped and polite exchanges between barbed Brits. An Oscar is long overdue.